For an area rug that meets all your criteria, consider a custom rug fabrication. You don’t have to be a Vanderbilt or a Rockefeller to order a custom area rug fabrication. 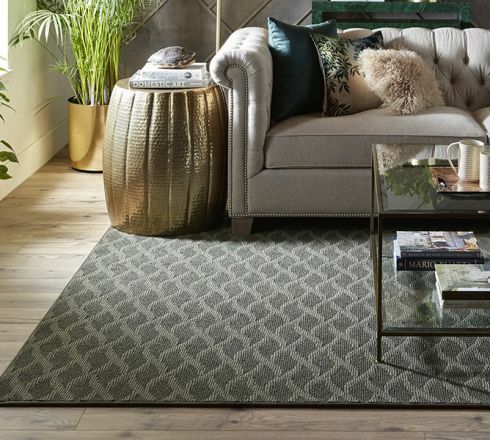 If the array of area rugs isn’t checking all the boxes, then it’s time to think out of the box. Twin Oaks Carpet custom rug fabrication can conjure the rug you want. Its shape, color, pattern, etc. The beauty of a custom rug fabrication is that your choice goes beyond pre-made area rugs and carpet remnants. We can make you a rug from broadloom carpet; your selection has exponentially increased. Don’t worry, we can pre-select broadloom that meets your needs. Once we have your order, if we have the broadloom in-house we’ll cut the amount you need. If we don’t have it, we’ll order it. We will then take your piece of rug and cut it into the size and shape you specify. If it’s an intricate shape, we might ask you to come in and approve it. The next step is finishing the edges. Normally the edges are bound. If you want a fringe, the edge is serged and the fringe attached. A non-skid backing can be added to an area rug or runner. If we order the broadloom, it can take up to 5 days for delivery. Binding takes up to 3 days. A good estimate of when you will have your finished custom rug is about a week after ordering it for our service area of Romeoville, Plainfield, Lemont, Bolingbrook, and Joliet. Are there any special processes used for custom area rug fabrication? Not unless you consider personalized service special! You may know Twin Oaks Carpet for tile laminate, hardwood, and vinyl as well as for carpet. Now you know that custom area rug fabrication is yet another aspect of the complete services offered by Twin Oaks Carpet.